Kapatiran Suntukan Martial Arts is a tribal community that reaches beyond martial arts. We believe in helping and growing together not just in a combative arena, but in all aspects of life. We all have different aspects in life that appeal to us, and as a group we have found that it is much better to share these with each other to facilitate growth, expose new information and interests to others, and to learn more about who and what we are as people. To be successful in life and martial arts, we must be multi-dimensional, and we see the Brotherhood as a place of acceptance and a place free from judgment. A strong sense of humor is at the core of this group, and binds us together, and has helped all of us through some rough patches. We know we can rely on one another for information, guidance, a timely joke or a recommendation for a new beer or getting turned on to a new band. A typical KSMA get together is of course centered around the martial arts that bring us together, but the non-training time is just as important for us. Before or after training, we can be found desperately seeking coffee, cooking, sharing stories and jokes, and good natured ribbing and banter fill the time. It can seem insulting, until you realize that most of us have known each other a long time, and have a love and respect for each other that let's us freely joke on a level that is very personal without being hurtful. We also swap recipes, share and commiserate about work, and provide guidance and support for each other. 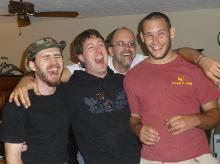 It is a special time when we get together, as it is a family reunion of sorts. Another thing that we highly value is being able to discuss and debate many subjects in a respectful manner. We are all passionate about what we believe but value the interchange, as a core tenant of KSMA is accepting and understanding different points of view. Potential members must be met face-to-face prior to joining the group in order to make sure it is a right fit for all parties involved. Members are required to attend one sanctioned seminar annually to maintain membership. These events are opportunities to train with different people outside our local groups as well as delve deeper into the Spirit and Physical Culture which drives KSMA. 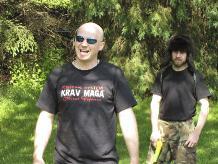 KSMA is a "pay as you play" group and to become a member the potential candidate has options. The first option is to contribte something annually to the group. This will be discussed by the member along with Terry to make sure it is something the member is able to accomplish. The next option if the candidate is unable to contribute in some way is a $50 annual membership fee. If the candidate is going to run a Study Group for KSMA programs, then an annual fee of $10 per person being trained is implemented. If you are exploring and requesting feedback in your own art, there is no fee for your students. Unless the people being trained have met the criteria for membeship, they are not considered members of KSMA. 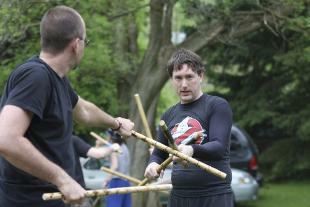 Those seeking rank in Aneh Palu Kali-Silat or certification in Personal Survival Tactics will have $75 testing fees for each level and the Instructor test is free. 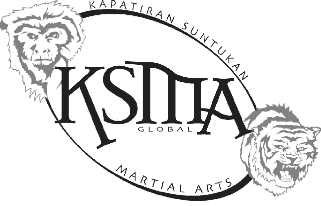 Please contact us if you are interested in joining, hosting a seminar or have questions about KSMA. Lodging and travel is the responsibility of the host-varies and is dependent on mode of transportation and locale of lodging. Any profit over covering the costs of the seminar and lodging will be split between KSMA and the host.